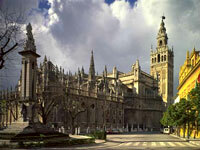 Spain's great southern city of Seville has a romantic past and a rich Moorish heritage. Seville is the perfect setting for high culture and romantic operas like Carmen, Don Juan and Figaro, and the romance is not just cultural: the poet Byron famously rated Seville for its women and oranges. Modern visitors might add flamenco, tapas and bull fighting to the list of attractions. The soul of the city is best epitomised during its two passion-filled grand festivals, the Semana Santa, held the week before Easter, and the Feria de Abril, held two weeks after Easter Sunday. Seville has an impressive collection of historical sights, including its cathedral, which is one of the largest Gothic buildings in the world. Having been occupied by the Moors for 500 years, the city also has a legacy left by the Arab kings in the form of the Alcazar, a palace-fortress that is regarded as one of the finest surviving examples of Moorish architecture. Seville is the regional capital of Andalucia, which contains the densely populated beach resorts of the Costa del Sol along its southern reaches, and the mountain villages of the Sierra Nevada range further inland, about 25 miles (40km) from the coast.